The helicopter service named Pawan Hans and Global Vectra helicopter takes people on the foothills of Katra till Sanjhichatt through its service. The tour remains adventurous while touring to the Shrine while one experiences the clouds enveloping the area to make it typical experience. Use the website (matavaishnodevi.org) for registration and mention New Devotee Sign Up while registering. It takes no time to create your user name and password. Once done then close the links and restart the webpage for easy accessibility. Click on the Helicopter Services upon logging in through your user name and password to avail such services. It is easy to book the Vaishno Devi Tickets by making selection of date, passenger details, timing and route amongst others. Use the payment gateway and click that link to directly go to your bank’s website through which you would make the payment. Other details you must mention are the credit card number and its CVV in the back side besides explaining the expiry date amongst others. One the bank accepts the credit card transaction a message would appear on the secure site where you click Yes to conclude the transaction. Once it is done your booking completes and now it is the time to take the printout of the booked ticket. Please Note: If the devotee couldn’t take printout after doing the reservation and or in the particular circumstances while transaction had faced any issue. Like you check the Maa Vaishno Devi Darshan Timings you as a Devotee should reconfirm and check for the Transaction Status whether it was successful or failed and or your funds were refunded due to the transaction having not completed due to one reason or the other. Use Online Services on this website by using the correct username and password prior to attempt for the same process and to continue with a new transaction afresh. Don’t repeat the same reservation if your transaction shows successful. As it is done and you have the confirmation ensure taking printout of reservation done by using the re-print option on the website. In case the transaction thoroughly indicates a Failed one then it is time you should redo the entire process and attempt a new Transaction again. Your reservation won’t be done if there is Failure Status of the transaction made. Reservation confirmation can’t be ascertained by mere amount deduction from the specific bank hence the devotee doing the Vaishno Devi Tickets should take that into account and start the process once again until confirmed. It must be noted that reservation won’t be done even if the amount gets deducted from the bank but it shows the “Failed Transaction details or Refund Status of Failed Transaction” etc. As the status is in the failure mode reservation won’t complete so is it a failure one. All devotees are advised to ensure that they must forward transaction details including Track ID No/ Trace No, user ID and date of transaction done to [email protected] for any type of settlement or initiating refund case if any. The respective card accounts of the devotee would be filled with the funds refunded for any of the failed transactions initiated in a certain time period as required by the bank for processing. Check the Reporting Time mentioned in the PTD and ensure that you have reported at the place from where passengers are supposed to depart. Do it at least one hour in advance to make things hassle free. Those reporting at the place beyond the timing indicated would be treated “NO SHOW” passengers so their seats might be given to someone else for which the Operator reserves such rights. The children passengers below 2 years would travel without paying any money. An adult must carry them in lap. Producing a valid age proof document would be sought to decide in case there occurs any type of dispute related to infant’s age. The operation of helicopters depend on the climatic conditions like better weather condition and visibility must remain clear for suitability for which the DGCA and ATC gives clearance. Eight minutes are the total time taken by the flight from Katra to Sanjichhat. One flight of Pawan Hans and Global Vectra can carry 5-6 passengers in one go. One way Rs.699/-per passenger fare is charged for journey from Katra to Sanjichhat and vice versa. The location of Helipad is nearly 2 Km. from the Udhampur Road based Katra Bus Stand. 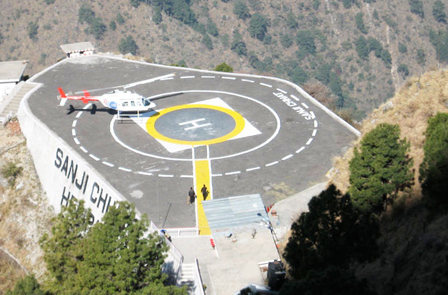 The distance between Vaishnodevi Bhawan and Sanjichhat helipad is nearly 2.5 Km. No cancellation or pre-ponement/postponement of timing is permitted once booking confirms. The process of full fare refund would be applicable if the cancellation is from the operators of helicopter due to technical reasons or bad weather. The booked tickets are completely nontransferable. The refund would be made through the Shrine Board if the transaction has failed on the Board’s website itself.